The Explorer Program was started in 2003 by Sheriff Gary Clark as a way to help our young people get a head start into careers of the law enforcement field. The members of the Explorer Post learn law enforcement skills such as how to perform traffic stops and defensive tactics. The program currently consists of two lead advisers and two assistant advisers who are fully sworn deputies with the department and possess numerous certifications and years of experience. 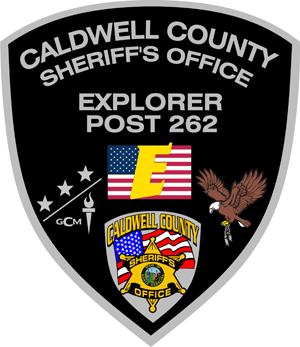 If you are interested in the Caldwell County Sheriff’s Office Explorers please contact Sgt. C.J. Bentley at (828)759-1534, Deputy M. Sharpe at (828)759-1529 or Stephanie Lail at 828-759-1552.